Managing a classroom at the high school level can be a bit tricky, and whole different ballgame from teaching early or elementary ed. 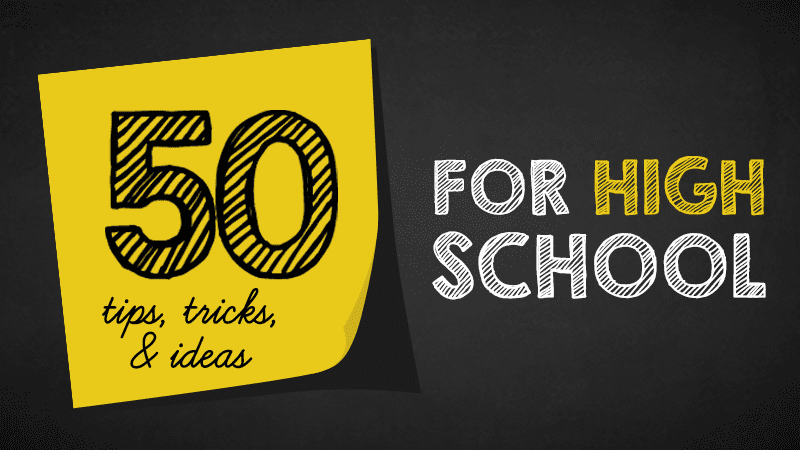 These 50 tips and tricks for high school classroom management come from our community of seasoned educators from across the country. It’s great advice for kids of all ages, but particularly for the teenagers in your life. There’s no doubt—sometimes high schoolers will push back over who’s in charge. “I often remind my high schoolers, the classroom is not a democracy. And although we are a team in this learning journey, I am, in essence, their boss (although they quite often remind me that I can’t fire them).”—Jen J. “High schoolers smell fear. Say what you say with confidence—do NOT let them think they are smarter than you.”—Linds M.
“Students know—and you know—that mess-ups are bound to happen. If you make a mistake…own it. Admit it. It’s ok. Everyone makes mistakes.”—Linds M.
Share your unique self with your students—authentically. Teach to your strengths and use your own style. “Do YOU and no one else. LOVE what you do and they will feel it.”—Tanya R.
Teens seem to have particularly sensitive BS meters. They can spot a disingenuous adult from a mile away. “Be honest with your students—they see through hypocrisy and will lose respect for you.”—Heather G.
“Little things mean a lot to high schoolers.”—Kim C.
“Small, fun things go a long way to make them smile.”—Lynn E.
7. Be the adult, not their friend. This was the most frequently mentioned tip for high school classroom management — keep a firm line between kind, caring mentor and buddy. “Be real with them, but don’t try to be their BFFs: they need you to be the stable adult.”—Heather G.
8. Have clear, consistent boundaries and behavior expectations. “Have the students create a Behavior List for classroom on the first few days, and post that list as a reminder—they know what is right/wrong, hold them accountable.”—Carol G.
9. Model what you want to see. “Model, model, model your expectations! Don’t assume they’ll just know. I’ve taught from 7-12 and I model everything from how to walk into my room for class to how I dismiss from class and everything in between.”—Amanda K.
10. Be consistent and fair. “You’ll lose them fast if they see you are not consistent and fair.”—Amanda K.
“Be friendly, but not their friend. Don’t overshare. You are not seeking their approval, they will seek yours.”— AJ H.
“Work to have an inscrutable poker face.”—Lia B. 12. Involve students in their own learning. “Show that you are willing to listen to their ideas and implement them when practical.”—Sharon L.
13. Don’t talk down to them. Nothing turns a teen off faster than someone underestimating them. Treat them like the capable, intelligent people you expect them to be. “Above everything, don’t talk down to them.”—Vanessa D.
“Talk to them, not at them.”—Melinda K.
Most teens are perfectly willing to do the work, once the reason for it is clearly defined. “I find my students are much more responsive when I take the time to explain why we are doing what we are doing”—Vanessa D.
“Giving your students a logical explanations of how what you are teaching will benefit them in their future.”—Joanna J. “Teachers who try to be too friendly too fast (not that you shouldn’t be kind and smile often) or who talk down to their students will lose respect as fast as a teacher who is rude or unprofessional.”—Sarah H.
16. Set high academic expectations. Obviously. Teens pick up on who they really have to work for and which classes they can blow off. “Set and maintain high expectations for learning.”—Vanessa D.
17. Use your time with them wisely. Keeping them busy — the whole period — will keep the need for high school classroom management to a minimum. “Work bell to bell.”— Kim C.
Teenagers can be champion negotiators. Don’t get drawn into extended debates over decisions that need to be made. Let kids know that your word is your bond. “Don’t waffle with decisions.”—AJ H.
19. Be firm. All year. “Hold students to the rules in the beginning of the year…you can slack off a bit at the end. It’s extremely hard to do the other way around.”—Jen J. If you promise your students something, whether it be a reward or a consequence, follow through. “You’ve got to be consistent to build students’ trust.”—Liz M.
“If you threaten…you absolutely MUST follow through with it. Also…use threats sparingly. Too much or no follow through means Zero credibility.”—Linds M.
“When they are doing something that isn’t ok – talk with them ask them what’s going on to make them behave in such a way. Most of the time it has nothing to do with you … they lash out at school because it’s their safe place.”—J.P. “The key to teaching high schoolers- keep your sense of humor, acknowledge your mistakes, laugh at yourself and what happens around you, and go back and remember how you felt as a teenager. My students keep me real–you’ll love it!”—Bonnie S.
24. Keep your sense of humor. Teens have such a unique and curious view of the world. Use humor in your classroom as often as you can. They’ll enjoy it and you will too. “Don’t be afraid to joke with them as well as discuss serious world issues.”—Sarah H.
“I highly recommend an inexpensive shoe rack like this one for cell phones…like a parking lot. We had one in my last classroom and if the kids were caught with their phone out, after they were told as a class to turn them off and keep them put away, they’d have to put it in the shoe rack for the rest of class. Some of them had it parked so many times that they’d just come in and put it there from the start.”—Amanda L.
Purple hair, ripped clothes, piercings, and tattoos. High school is a great time to experiment with personal style. It’s also a time for teens to start defining their own personal values and begin to question mainstream wisdom. Make space for differences of style and opinion. “Always being mindful to respect each student’s individuality. Teenagers are teenagers.”—Margaret H.
27. Do not treat them like little kids. “High schoolers want and need some autonomy in learning and hate feeling like you are trying to “hold their hand” through every little lesson/activity. They have so much more maturity and insight than what you might expect.”—Cathy B. High school kids are really little kids in big bodies. They still like to play and have fun, but they’re also on the cusp of adulthood and so they want to be treated as such. “High schoolers not as different as you might expect. They want to feel valued and respected. They want to know their boundaries.”—Mindy M.
Notice the quiet ones in the back row, encourage everyone to share their opinions, and most of all —don’t let a few kids highjack the spotlight in your classroom. “Include each student … don’t let a few get/take all the attention.”—Kim C.
They’re not grown yet. Parents are still an integral part of their education. Rely on them for support and insight. “Contact parents regularly, for the good and the bad.”—Joyce G.
31. Don’t be afraid to hit up your colleagues if you need back-up. Sometimes extracurricular activities are a great bargaining chip to keep students on track in the classroom. “I had more luck with emails/talking to the coach than the parents most of the time.”—Emily M.
32. Follow the Golden Rule. What a simple, beautiful truth for high school classroom management and beyond. Treat people the way you would want to be treated. “My best piece of advice is respect begets respect.”— Joanna D.
33. Share their zest for life. Sharing in your students’ discoveries is one of the best parts of the job. “Taking my students on field trips to expose them to things they’ve never known about (or even cared about) has always been the highlight of the year.”—Lynn E.
“Set clear boundaries and stick with them, but don’t make or see everything as a challenge. If you stay calm and respect them, they will show respect for you. Be reasonable but consistent,”—R.T. Uptight adults rarely get the response they desire from teenagers. “Don’t micromanage and don’t sweat the small stuff.”— Kelli S.
36. Turn a blind eye occasionally. “Kids will test you. Don’t react to things they do to try and get a reaction.”—Vanessa D.
“Ignore what you can and reward the positive.”—Beth S.
Losing your temper is a lose-lose. If you need to, give yourself a time out. “Probably the biggest thing of all: never get into a shouting match with them because you will instantly lose control.”—Eli N.
38. Don’t be surprised by age appropriate behavior. By high school, kids should know the difference between the right way and the wrong way to behave in class, but sometimes their social nature and youthful exuberance get in the way. “They will interrupt you and talk about gross things.”—Mindy M.
“Don’t take it personally when they are one hundred percent more interested in each other than they are in you.”—Shari K.
39. You may have to grow some thick skin. “Sometimes kids will say hurtful things to get back at you if they’re upset… don’t take it personally.”— Wendy R.
41. See the good in them. Yes, they seem to have a language of their own, and yes they sometimes pretend like they could care less, but they’re also really capable and accomplished and have amazing energy and ideas. “Focus on the positives!“—Stacy W.
42. Value them for who they are. Every human wants to be seen for who they truly are. Teens are no different. “The longer I teach, the more I realize how desperate students of all ages are to know that someone values them, that someone truly cares.”—Lynn E.
Being a teen can be tough! Sometimes the best things you can your high school students is your time and your focused attention. “Be a listener- sometimes these kids just want someone to listen to them and not judge them.”—Charla C.
Teenagers have a lot to say. Let them teach you a thing or two about their interests of experiences. “Big kids like stamps and stickers, too.”—Joyce G.
“They also still love coloring, silly stories, and lots of praise.”—Sarah H.
“And don’t think that they don’t love candy, pencils, any sort of recognition! You’ll laugh more with these big kids than you ever thought possible.”—Molly N.
For more tips on how to engage high schoolers, read this WeAreTeachers article. 46. Have fun with them. “Sometimes it pays to take a break from all the “adulting” that comes with being an 11th grader and corner off a piece of the parking lot and throw a frisbee with my students.”—Tanya R.
“High schoolers want to be treated like adults, but are still kids at heart.”—Faye J. “Love them, just as fiercely as you love your littles, cut them (and yourself) some slack.”—Heather G.
48. Create a welcoming community. “Make your classroom warm and welcoming.”—Melinda K.
“Greet them every morning as they enter your class and as they leave!”—J.P. 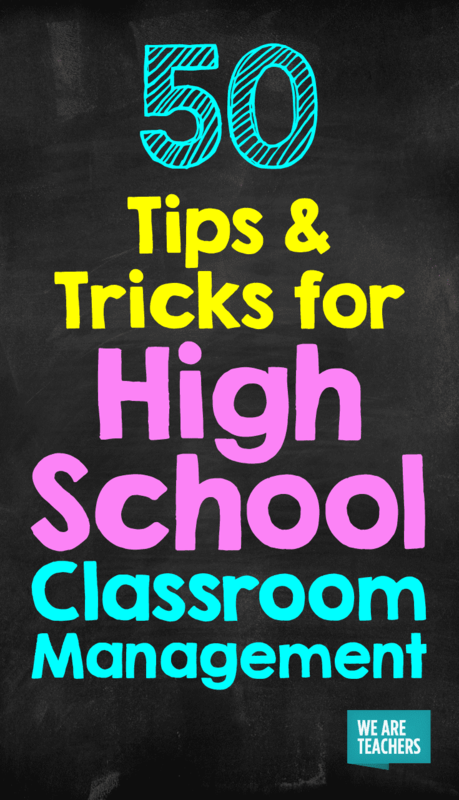 “Teens appreciate visuals of whatever it is you are teaching, motivational posters, and a bright and cheery well-decorated classroom.”—Theresa B. “My seniors LOVE warm fuzzies on their birthday. They get a candy bar which makes up for having to sit in front of the class and hear good things about themselves.”—Candice G.
And finally, teaching high school is not for everyone. But for those who have made a career of it, there is nothing else like it. “Hang on and enjoy the ride!”—Lynda S.
What are your tips for high school classroom management? Share any we missed in the comments.